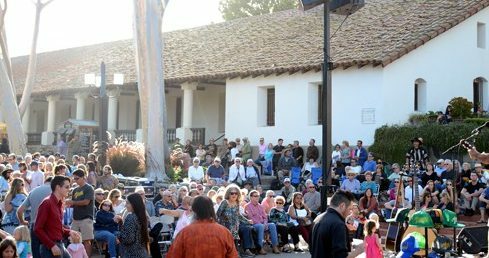 San Luis Obispo City Council members approved the purchase and installation of security cameras in Mission Plaza, Meadow Park and Mitchell Park at a cost of $60,000. The cameras will monitor and promote public safety at the parks. Currently, the SLO Police Department has 10 cameras at public locations throughout the city. City officials want cameras at parks where large groups of people congregate for public events, according to a city staff report. City officials approved the installation of two poles at Mission Plaza to mount cameras on. In addition, one camera will be placed at Mitchell Park and one at Meadow Park because of previous “adverse behavior in the area,” according to the staff report. All footage, at no charge, should be accessible to the public for any time frame in storage since all recordings are of public places staring unpaid talent. Cameras just observe and for the amount of funds going to SLOPD we should be receiving proactive policing, crime prevention, streets and parks citizens can enjoy, not the creation of unwatched footage featuring the homeless laying around day after day. This is a furthering of the distance between PD and citizens while all the while they sprout platitudes of community engagement. We either clean SLO up from where it has sunk or accept it and further denigration. Because a Panopticon is what they ultimately want to do. Information obtained from these cameras will help SLO determine where the next homeless shelter should be constructed. How about computer controlled camera drones? Then they could look in windows to make sure you are obeying…. If video cams prevented crime, YouTube, Reddit, and the news programs would be devoid of any content. At least the PoPo will know right away where to come and take the report or clean up the mess. And so grows the police state. Of course, $60,000 is just the beginning. Year after year they’ll take maintenance and replacement, and somebody will have to be hired to watch the footage they generate. Amazing how our dear city can flush our money down the toilet. At least it’s not as costly as the idiotic $1.3 million bollards the city purchased to make farmers market “safe” from something or other. Like I said, they find the money for their own fun and games. Especially to spy on us and to make us miserable. For shame city council. Where are the other 10 cameras already installed? Would be nice to know where big brother is watching.